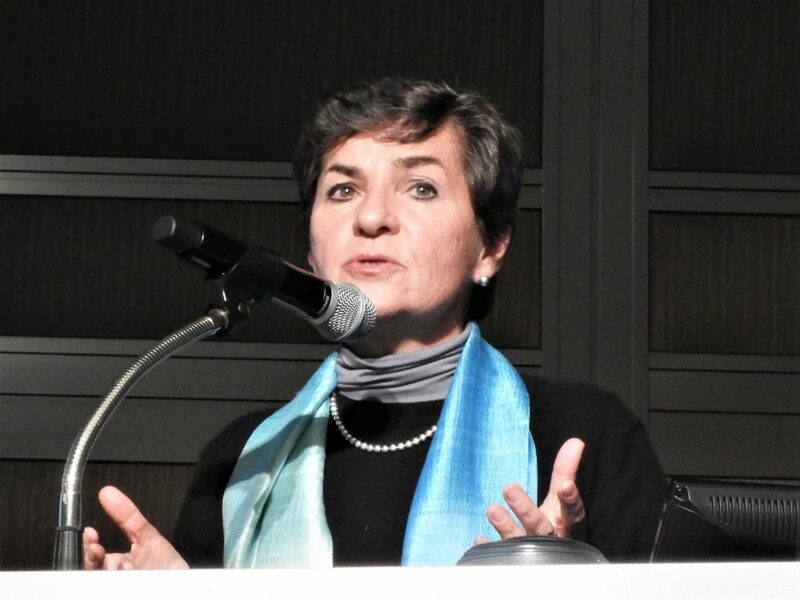 In February 2019, the Japan Climate Initiative (JCI) held a symposium “How Climate Action in Japan can lead the world – with Christiana Figueres (Former Executive Secretary of UNFCCC)” on 12 February, 2019. During the event, JCI welcomed Ms. Christiana Figueres, the Convenor of Mission 2020 and Former Executive Secretary of UNFCCC as a special keynote speaker on the theme of “The decarbonization revolution and the expectation for Japan demanded by the Paris Agreement”. In her speech, Ms Figueres presented five imperatives of global decarbonization to a crowd of the Japanese non-state actors and the Japanese government officials in the venue. The speech was truly convincing and again and was a reminder about the urgency of climate change. We share her speech provided by the Mission 2020 secretariat as shown below. Please do read the encouraging message given by Ms. Christiana Figueres with the expectation for Japan to stand on the frontline of the global decarbonization. I have just been in Kyoto. I went to say thank-you because without the Kyoto Protocols we would not have had the Paris Agreement. Kyoto was the roots and Paris was the leaves or blossom. The world is looking to Japan for leadership. Decarbonization of the global economy is unstoppable and it is exponential. I would like to outline here the five big imperatives of decarbonization. First is the moral imperative. If we allow the world to go to 2 degrees temperature rise rather than keeping it to 1.5, a 2 degrees rise would give us, two to three as many times the number of people threatened by death because of lack of water or hunger. There will be two to three as many times people forced to leave their homes because they cannot survive there or because they have been driven away by extreme weather events. There will be a lot of pressure on migration towards other countries. And most of that migration pressure will be in Asia. That is a moral imperative that we have to understand. When everyone including Japan adopted the Paris agreement in 2015 we didn’t have that scientific certainty, but now we do. We now have to change the GPS of the global economy and head now for 1.5 and no longer for 2 degrees because the moral imperative dictates that we as the responsible adults of this planet right now have to make sure that we are headed in the right direction and make sure that our decisions today will not have huge economic and in fact existential consequences on our future generations. Japan is no exception to this. Since, already last year without having to wait for more natural disasters, I don’t have to remind you that Japan suffered the loss of over 200 lives because of floods and over 1500 lives because of heat stroke, just a small example of where we are headed. And you all know that the Olympics being planned for 2020 will have to start early in the morning. The Olympics walking will have to start at 5 am and the marathon at 6am because of the heat that is expected here in Tokyo. Enough said on the moral imperative. I think we all as responsible human beings and adults know that it is our moral responsibility to make sure we are not headed to disaster today or tomorrow. 2) The second imperative – and all these imperatives are mutually reinforcing – is the technological trend imperative. Today already 25% of the electricity on the global grids of this planet is renewable energy. And just last year already 2/3 of all of the new electricity capacity put on line was renewable energy. Only 1/3 came from the family of fossil fuels around the world. Even in the US, the US patent office that receives requests for patents in technologies that are being developed has consistently over the past few years received 10 times as many requests related to innovation relating to renewable energy as those that have to do with fossil fuels. The technological trend in the energy field is incontrovertibly towards renewable energy and no longer a trend toward fossil fuels. We should thank the fossil fuels, as they gave us the kind of development that industrialized countries have now. I am now 62 – and we older people deserve to be thanked and put into retirement. The same thing goes for fossil fuels. 3) The third imperative again that is reinforcing the movement toward decarbonizing the global economy is the increased awareness of financial risk that of high carbon, certainly in coal and also in oil and gas. This is one awareness of the financial risk is one that has been growing over the past 5-7 years very helped by the task force of financial risk disclosure where companies and financial institutions are being asked to assess for themselves the financial risk to which they are exposed because of their portfolio, because of their products. As a result of the growing awareness of the financial risk, in particular of coal, we have a long list –now 3 pages long –of financial institutions of all sorts that have actually already taken the decision to no longer finance coal. 4) The fourth imperative is what I would call the social license imperative. What I mean is the ongoing movement of people in rural and certainly in urban areas that no longer want to compromise their health. These are people who actually want to breathe clean air! You will all have read reports of the demonstrations in China and read the reports of air quality in India. People simply don’t want to have bad air quality. Someone born and who lives in Delhi statistically has 6 years less to live than anyone born in any other city in the world. That is not fair, and that is because of air pollution. The burning of coal for electricity produces not just CO2 for the global atmosphere but also local particulates that are contributing to air quality problems and also the burning of liquid fossil fuels in transportation is also causing local air particulate pollution that is contributing to poor air quality. So the entire family of fossil fuels is under growing pressure from the lack of social license to operate. And a lot of pressure to close down coal plants. To move vehicles towards electric vehicles – EVs. 5) The fifth and final imperative is the generational justice imperative. Should we continue as a planet to increase greenhouse gases as we have done for the past two years and as we have done for the past 150 years, we would way exceed the 2 degree maximum temperature rise and certainly the 1.5 degrees. What that means is that future generations will have to live in a world that is so unstable that it will be very difficult for them to have any predictability about their life whatsoever. We would move into a world that the insurance industry calls systemically uninsurable because the degree of destruction will be such that the insurance companies cannot deal with level of risk that would be brought upon us. We frankly have no other option. This is not “Do we want to do this or do we want to do something else?” We frankly have no other option. Look at all these five imperatives and how they stack up – they are mutually reinforcing. That they all bring us not only toward less risk but actually toward more opportunity. Because once decarbonization takes place, and this is the story that can be told by individuals and companies who are already on this path, what you see there is the opening up of opportunities. A carbon constraint is actually huge ingenuity opportunity. That is true for every company, true for every city, and any country. That is where we need to move toward. So what does that mean for Japan? From my small perspective, I think Japan has two choices and only two. Choice number one – to lead – because Japan has everything it takes, it has natural resources, it has the capacity in its labor force, it has technology, it has the capital to lead and should be leading aggressively into a world of much more opportunity and much more stability. Choice number two is simply to be left behind and be controlled by technologies of the last century, but as I’ve already said they should be in retirement or in the museum. So that’s the choice. Does Japan want to lead or be left behind? Frankly, given the speed of the decarbonization around the world, I don’t think there is any in-between choice there for Japan, because decarbonization is happening at an exponential rate in many fields – not in all, but in many fields, and in those fields where Japan would participate, definitely at an exponential rate.